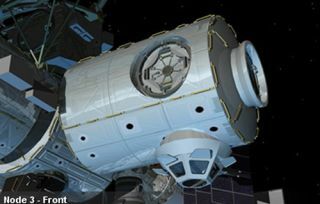 An artist's conception of the installed Node 3 module on the International Space Station. ComedianStephen Colbert is pulling out all the stops in his campaign to have NASA namea new room of the International Space Station after him. "Wellyou voted, folks and look what happened,? Colbert said Monday night on hisfaux-conservative show "The Colbert Report" on Comedy Central. ?Unfortunately, Houston may have a problem with it." Colberturged his viewers to write his name in during NASA?s recent voting poll to nameNode 3, a new room for the space station that will launch on a future shuttlemission. The move apparently worked, with Colbert?s write-in name nabbingmore than 230,000 votes, beating NASA?s top suggestion Serenity by morethan 40,000 votes. There hasbeen some speculation on how NASA will respond to Colbert?s popularity inspace. NASA has said that while it reserves the right to have the finalword on Node 3?s name, it would take write-insuggestions into consideration. ?We?restill thinking about it,? said William Gerstenmaier, NASA?s space operationschief, on Saturday. Somesources have suggested that NASA will meet Colbert?s audience halfway byopting to name the space toilet for Node 3 after the comedian. Gerstenmaier,however, shared little during a Saturday briefing after the shuttle Discoverylanded in Florida. ?We have aplan and we?re working with some folks,? Gerstenmaier said. ?And in a couple ofweeks, you?ll know what the answer is.? In additionto writing in their suggestions, voters were given the opportunity to select aname from NASA?s list — Serenity, Earthrise, Legacy and Venture. "Serenity?That's not a space station, that's an adult diaper," Colbert said. Node 3 is anew room for the space station that will launch aboard a NASA shuttle. It will includean astronaut toilet, eight refrigerator-sized equipment racks and much ofthe station?s life support gear. It will also be the site of an observationportal to serve as the main workstation for the orbiting lab?s robotic arm. "Nowfor laymen out there, a space node is a node-like structure that is attached toother nodes in space in a ? I don't know what it is, but I want it! "Colbert said in Monday night?s episode. Colbert hasdrawn support for his name not only from the public, but also Congress. In a March26 statement, Congressman Chaka Fattah (D-PA) urged NASA to respect the resultsof the agency?s online poll. ?NASAdecided to hold an election to name its new room at the International Space Stationand the clear winner is Stephen Colbert,? Fattah said in the statement. ?Thepeople have spoken, and Stephen Colbert won it fair and square — even if hiscampaign was a bit over the top.? Fattahpointed out that NASA?s top choice Serenity finished well behind Colbert?sname. ?WhenAmericans look to the sky, they may see ?Serenity? but there will be noserenity here on Earth,? Fattah said. Colbertalso enlisted the support of Derrick Pitts, chief astronomer for FranklinInstitute in Philadelphia, Pa., during Monday night?s ?Colbert Report.? "As anastronomer, basically you are an ambassador for space,? Colbert said. ?Do youagree with him that the node should be named after me?" "Ithink that's something that NASA's going to have to figure out, but you know,it could be a good idea,? Pitts replied during a discussion about Galileo. NASA?s topvote-getter Serenity is a moniker that is also, coincidentally, the name of thefictional spaceship in the ?Firefly? science fiction television series. WhileSerenity came in second, it was the only NASA-selected name to make the topthree. Coming in third was the write-in selection ?Myyearbook? with 147,637votes, with the write-in ?Gaia? a solid fourth with 114,427 votes. In all, thenaming poll received about 1.2 million votes. "SoNASA, I urge you to heed Congressman Fattah's call for democracy in orbit,?Colbert said. ?Either name that node after me, or I too will reject democracyand seize power as space's evil tyrant overlord. Ball's in your court."